A chess master is foremost an expert in chess strategy! The good news is that strategy can be learned and you can improve from beginner to master level and even more with a serious, structured training program. It's not the same thing with tactics. Little can be done to become a great tactician if there is no natural talent for that. There are many masters, even grandmasters that are not great at tactics but they win their games in a brilliant positional style. They are able to suffocate their opponent in order to prevent them reach double-edged positions and avoid complications altogether. One of the most important chess strategies of a grandmaster is to bring their pieces in the best possible positions as fast as possible! Although the two armies are of the same quantitative value, the pieces of the master seem to be stronger. Why? Because they know to place them in safer outposts, with more activity, more tasks and in better cooperation with the rest of the pieces. The pieces of the grandmaster seem to cover the whole board and control all the key squares. From the opening, the master will develop all his pieces fast in the best possible positions. In the middlegame, the pieces will collaborate in a harmonious way to create an active plan of play and, at the same time, hamper the opponent's piece cooperation. The chess master will improve the position of their pieces to the best strategic position before the final strike. If you want to see great examples, study the games of Anatoly Karpov! You will see that he prepares the final strike with a very meticulous precision. He brings all his resources at the right place. A good chess strategy is to imagine the best possible position for each of your pieces and endeavour to bring them there. From the center, the pieces go faster and easier to any place on the board so the chess master will always try to control the center. In the opening and middlegame, the master will try to control at least 2 out of 4 squares in the center and as many squares as possible in the large center (the c3-c6-f6-f3 square). In the endgame, the king is usually better close to the center, where he becomes as strong as a minor piece. Every active operation will take into consideration the center. Before the master will start an attack on a flank, he/she will secure the center first. If the other player starts an attack on a flank, a very strong reaction is a counter-attack in the center. A good control over the center is a must if you want your chess strategy to work. As a sore point brings troubles to a whole body, a positional weakness is a breach and an objective of attack for the opponent pieces. 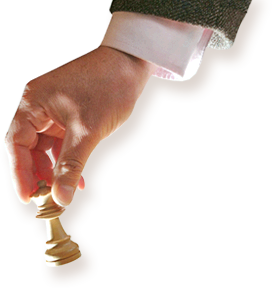 When there is a weakness, the grandmaster will immediately start to press there with all his force until his opponent cannot hold the position anymore. Yes, the grandmaster attacks you where you are weak and hurts you the most, not where you are strong. The continuous pressure on a weakness also brings the initiative. The player with the initiative can carry on with his tasks easier as he is in attack while his opponent has a passive role and just defends. A guaranteed good chess strategy is to discover the weaknesses in your opponent's camp and attack there. But what if there are no weaknesses? The grandmaster will do anything to provoke them! To create weaknesses in the opponent's camp, the grandmaster plays fine chess strategy, using all his creativity and tricky techniques. The strategy of weakening squares, pawns, or king's position is a real grandmaster's technique. 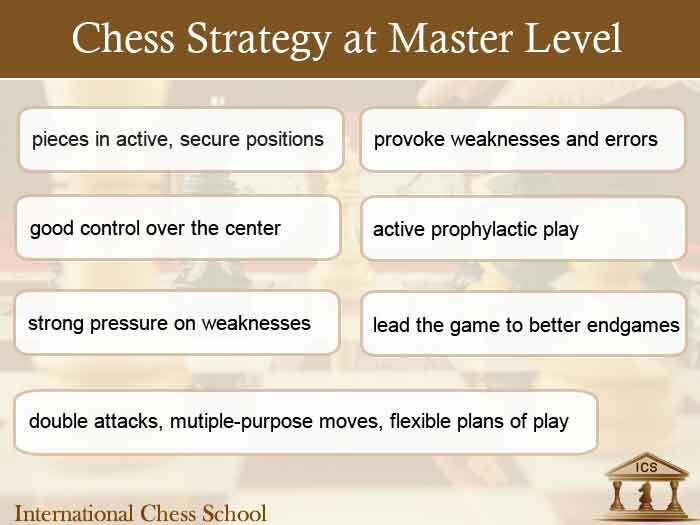 We teach the complete strategy of provoking weaknesses in our chess course "Grandmaster Package". You'll often hear among chess players something like: "The position was equal but my opponent won by luck. If I had not played that wrong move, the game was a draw." The thing is that the mistakes are provoked by a cunning technique of play or even by better management of the nervous tension. A treacherous strategy of the grandmasters is to use even their opponent's fear! The grandmaster will place his pieces in positions that look threatening, but without a real threat behind. Their opponent will think that the grandmaster must have a real threat... and will play unnecessary moves which, in fact, only weaken his own position. It is a war on the chess board and the nervous tension plays an important role. The nerves of steel assured Magnus Carlsen supremacy in the chess world. Use fine chess strategy to provoke weaknesses in your opponent's camp. If that is not enough, make use of any strategic trick to outsmart your opponent. Also called prophylaxis, this strategy is a real art. Absolutely all world champions were amazing at "suffocating" their opponents. Look at the games of J. R. Capablanca, M. Botvinnik, T. Petrosian, or A. Karpov and you will see many formidable examples of "simple" play. Their games may look simple and logic, but what is behind that simplicity? It is an advanced prophylactic play. Their opponents had not even touched the ball at all. The world champions knew how to restrict their opponents' counter-play to minimum and, then, they were free to execute their plans with that characteristic "simplicity". Do not let your opponent to do his own chess strategy. Obstruct his active ideas as early as possible and you'll be free to execute your plans! A good chess player can defend against an attack. However, it is much more difficult to defend against two or more attacks simultaneously. The most basic example in chess is the rule of the square in endgames, where the king going in a diagonal approaches two directions simultaneously. The grandmaster knows how to make plans of play and find moves with multiple purposes and while you try to defend against his strongest threat, you'll weaken your defense on the other part of the board. Alexander Alekhine, former world chess champion, is well known for his skill to play on both flanks of the board. This chess strategy is also used together with the fourth strategy - creating two weaknesses which are afterwards attacked at once (the double attack). A very powerful chess strategy is to choose moves and plans with multiple purposes or threats. Choose a flexible strategy whenever possible. Many games at master level are decided by this strategy. When the chess master spots a long-term weakness in the opponent's camp, like a bad pawn structure, he will be happy to lead the game to the endgame stage. In the endgame, the weaknesses become more critical as there are fewer counterplay possibilities and the master can win "effortlessly". Of course, winning complex endgames requires an advanced technique of play. We study this strategy and technique in the "Grandmaster Package", months 10-13. In the endgame, the chess strategy is less complicated and the weaknesses can be exploited easier. The complete chess strategy that makes a chess player a master is taught in much detail in our core chess course, Grandmaster Package. Article last updated on May 1, 2018 by the ICS webmaster. "Speaking as someone who has over 500 chess books (I am somewhat of a collector) I have found this program to be HIGHLY instructive and easy to assimilate. I finally feel like I have a systematic approach that can help me stay on track and meet my goals." - Roland W.
"As more and more pieces of the puzzle start to fall in place, I’m playing with a lot more confidence, I have won almost all of my latest games and will be gaining at this moment already approx. 130 ELO-rating points in 3 months." - Bart C.
"Thank you for such a great service, I have taken lessons from a GM before and this is much more affordable and just as good. My rating is 2151 now and I can't thank you enough for the great information you have to offer." - Cody W.
"I must say that your lessons are very interesting and am looking really forward to study hard at my chess. As a 2080 elo FIDE rated player, your method and approach look like a revolution to me and I realise now how bad I was working on my chess by my own. Thanks very much for your good work.z" Ronald A. "I raised my elo from 2164 to 2241 (and finnish elo from 2157 to 2257) during this summer much due to your program." - Ralph R.
"I would like to thank you and the staff for providing a high level of instruction at a low price. I won my first A-section tournament 1600-1900 section, with a score of 3 wins and one draw thanks to the chess school." - William M.